Grid tied solar power system, or grid-connected, solar photovotaic electric systems use light from the sun to generate electricity that can be used to power homes and businesses. These systems are designed to offset utility power usage and to compensate system owners for any excess wattage their systems produce through an arrangement known as "net metering". 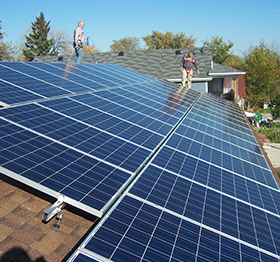 Grid tied solar power system can be operated from the roof of a residential home or the roof of a business. They can be mounted to the ground as well, such as many of those operated by community solar coops and companies. Because these systems do not include a battery bank to store energy produced by a solar array, they will not operate when the main power grid is down, such as during a storm, and they will not power your home or business during such an outage. A leading manufacturer of solar panel & solar light in China Founded in 2005. Providing one-stop service, save purchasing time and cost for our customer. Hinergy always focus on supply you high quality solar products. Well-trained and passionate team will meet all your requirements. Guarantee punctual delivery , Response within 12 hours, Financing support. With 5 people technology team, can help you get the best solutions.